THOR Comic-Con Panel Recap; Marvel Shows Around 5 Minutes of Footage in 3D and Brings Cast! Captain America might be The First Avenger, but the first Avenger to hit screens next summer is Thor and director Kenneth Branagh brought several of his stars, and a nice chunk of footage no one had seen yet, to present during the Marvel panel Saturday evening in Hall H at San Diego Comic Con. The film, about a Norse God banished to Earth after seemingly betraying his people, will hit theaters in May 2011 and this was the first time fans got to see footage from the superhero film. What was shown? What did cast members like Chris Hemsworth, Natalie Portman, Kat Dennings, Tom Hiddleston and Clark Gregg have to say about Thor? Hit the jump and find out. Right when Branagh took the stage, he sort of geeked out that he was able to see some of the mythology from his movie in the short Captain America footage that was shown. He also assured everyone that, though he was mostly familiar with English comic books, his favorite American one was Thor and he sought out the project when it became available. 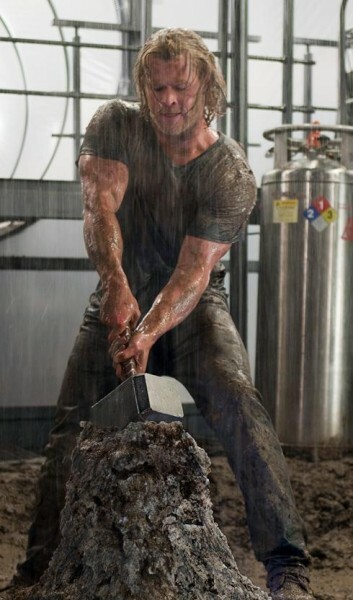 The first question was for Thor himself, Hemsworth, and it was about the hammer. He said they had a ton of conversations about its real world functionality and he feels they came up with a good solution. He continued talking about the character and specifically his messed up family, including his father Odin played by Anthony Hopkins. Portman admitted that her character wasn’t that well defined in the comic books but she relished that as an opportunity and enjoyed playing a smart, strong woman. She was also excited to get back to working with blue screen – a skill she picked up on the Star Wars films – especially with Branagh at the helm, because he had a whole different approach. Dennings seemed totally blown away by this whole thing and rambled along about how her character is totally new and is nothing more than Portman’s character’s protege. Hiddelston, who play Thor’s evil brother Loki in the movie, seemed very humbled that he’s playing, what he described, as a psychologically damaged character. When posed with the question how the real world of New Mexico and ethereal world of Asgard blended together, Branagh and Feige decided to show footage to explain. The footage, which was cut together as basically a long trailer, was way too much to digest on a single viewing, so thank the gods we got to see it again at the end of the panel. It starts off basically where Iron Man 2 ended: with the hammer in the desert. Cut to Thor being interrogated by Gregg because he destroyed a whole team of his men. We then go to Asgard, which looks sort of like a golden, more polished and richer version of Naboo, where Thor is being yelled at by Odin, stripped of his powers, and banished to New Mexico. “This is Earth, isn’t it?” he asks when he’s discovered alone, in the desert, but Portman’s character. She then bring him into her world where he describes that where he’s from, magic and science are one in the same. Back in Asgard, things don’t seem to be going too well and Loki is now the king, which seems to set off a bunch of things on Earth, including Thor trying – and failing – to lift his hammer. We then get a bunch of action stuff cut together, including some awesome stuff with Thor swinging the hammer and a bunch of the other gods, etc. In the end, we see a Destroyer come to Earth and blow up some cars before the footage ended. Oh, and did we mention it was in 3D? It’s still early in that process – the movie is almost a year away – but the 3D seemed very impressive in some scenes and totally pointless in others. I could take it or leave it. And that’s sort of how I felt about the footage. I wasn’t sure what I was watching. I had no idea of the through story in this movie. Where does everything fit in? Everything I saw – on its own, looked impressive and very promising – but all together, it was confusing. There will be some surprises in the film for fans of the Don Blake Thor. Portman will not be in The Avengers, but will return for Thor sequels, if they occur. Branagh said he felt very capable to direct this movie because his first film, Henry V, had so many of the same themes and plot points: battle, family issues, war, politics, etc. 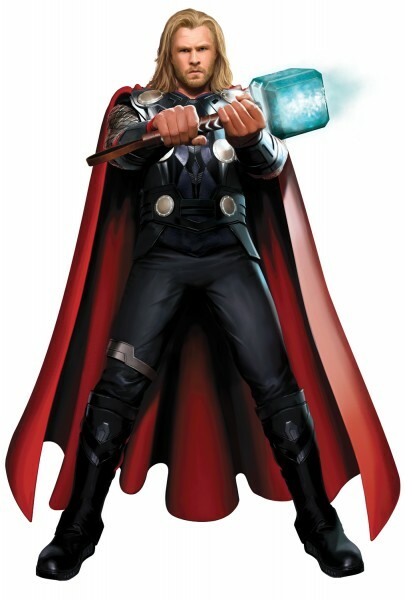 To prepare for the role, Hemsworth was given a ton of normal books, comic books, Norse mythology and more and basically just filled his head with it. Feige confirmed that The Punisher is back under the Marvel flag and that there’s a plan in place to get him back on the big screen. Branagh was both excited and nervous to tackle the action scenes because it was something he’d never done before but he knew the great team assembled could pull it off. Then they screened the footage again and that was it. With the Captain America sneak peak, this Thor panel, and ultimately the reveal of The Avengers, Marvel basically won Comic-Con. Other panels and presentations (Paul and Sucker Punch were my person favorites) were great, but overall, it was all about Marvel. Now, if the films are half as good as they look, and link together half as well as it seems they do, we could be in for a long line of great superhero movies.